In 1942, Stella Pastry & Café was opened as a classic Italian bakery and coffee shop. 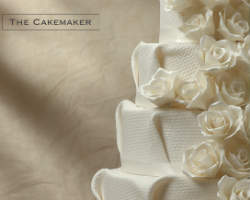 The cake specialties are the custom-designed Italian wedding cakes and cupcakes. So, these sweet desserts reflect traditional Italian taste and unique textures. With the rustic and chic ambiance of the store, it has been a favorite tourist spot over the years. Some of its served pastries are éclairs, napoleons, tarts, imported mousses and Italian cake slices. Stella Pastry & Café also bakes panetonne and fresh Danishes daily. Other types of cakes sold are the Sacripantina Cake, Tiramisu and Chocolate Fondant Cake. Join in an Italian festivity by taking precious bites of the exotic pastries by Stella Pastry & Café. 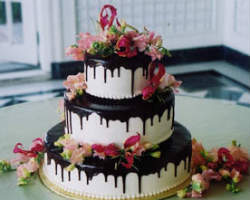 At Have Your Cake, customized wedding cakes and celebration cakes were made first in 1987 at San Francisco. The cake shop only uses the finest herbs and spices in baking their sweet treats, which has a certain touch of American and European tastes. It is also a kosher certified store. 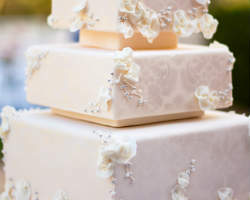 The cakes are made to perfectly go with the themed celebration and customers personal touches like replicas, cake toppers, fresh flowers, customized unique colors or anything that matches the bridal gown and motif. Choose a cake style at their portfolio, like whimsical and themes, rolled fondant, cascades and columns, wrapped presents, passion for chocolate, elegant buttercream and art deco in affordable rates, today. 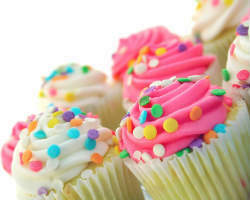 Gerhard Michler Fine European Desserts is fine cake baker with the best affordable prices in the state of California. It is able to create the sweetest specialty cakes and wedding cakes aside from owning its own line desserts, such as individual desserts, cupcakes, cookies, tarts, petite fours and bars. Seasonal dessert specials are also offered at the baker store. It produces hundreds to thousands of cakes and desserts just for one wedding. Gerhard Michler Fine European Desserts uses recipes that can be traced way back to 1989. And, as part of the improvisation of their client services, the baker has developed a 6-tiered cake design program for their customers and helping them achieve to die for cake styles. In 2003, as a product of her own efforts, Fleur de Lisa opened her first store named after herself, of course. It specializes on nothing but weddings. Upon a personalized consultation, this world renowned cake artist will enjoin both your creativity together with her own concepts to create magnificent wedding cakes in San Francisco Ca. Only the most natural ingredients and original cake artworks will be used in its recipes. Couples can choose from fondant-covered cakes, buttercream-frosted cakes, speciality cake styles and individual party favors. 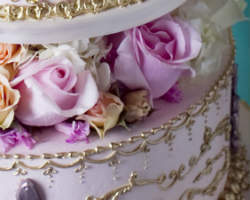 To name some of the best wedding cakes made by Fleur de Lisa are pillow cake towers, "I Do" Karat Cake and Café Olé cake. Everything is edible, but looks so real. Featured at the Summer edition of Today's Bride this 2014, at TLC’s Fabulous Cakes and in an article at Brides for June/July 2014. Fleur de Lisa recognizes the works of other wedding vendors for a more successful event. “I left my heart in San Francisco…” as the popular song says. At The Cakemaker, the first wedding cakes are made. The cake shop is able to create these very satisfying delights with excellent ingredients available in the market. With this way, your every moment for the wedding day is captured forever, as something to remember in hearts. For The CakeMaker, baking these cakes is more than what it is worth for. It’s the sense of fulfillment as well as accomplishment from the chef’s side to make it a joyous day for the couples. 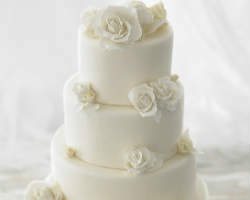 Wedding cakes in San Francisco Ca are added with make-ups to make them look lasting and so terribly tempting, with that, the store offers several varieties of flavors and fillings, like the lactose free cakes and fillings, gluten free cakes and house specialty cakes during anniversaries, bridal showers, baby showers and customized cakes. Just Cake bakes extraordinary wedding and celebration cakes. It is owned by Marina Sousa, a cake enthusiast, who uses inspirations from her background in theatre and fashion. Today, this renowned connoisseur has been honored for her own diversity in arranging cakes designs. The store also now hosts baking classes. One of their much liked San Francisco wedding cakes is the chocolate peanut butter wedding cake. 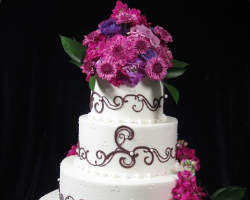 It is decorated with customized adornments and flowers in lovely pearly white and shimmering frosting. The classic collection of Just Cake best matches couples preferences for a more glamorous and elegant wedding. The store strikes a balance between tradition and innovation, simplicity and decadence. Cake Coquette is duly owned and managed by Gabrielle Feuersinger, who grew up in San Francisco. She is known for her cake artistry in making fabulous cakes for celebrities today, and has been widely appreciated by it. Cake Coquette specializes in modern signature wedding cakes at the Bay Area, like the Karat Cake, Marie Antoinette Wedding Cake and the Spanish Lace. Only quality ingredients are added in her cakes, which makes sumptuous fillings and oozing flavors in the smoothest textures for cakes. The store also accepts requests for custom cakes in San Francisco for different celebrations, anything for a breathtaking work of art. Owner/cake designer of Inticing Creations, Kelly Zubal grew up in Hawaii and using what she has learned from childhood, she baked her way to success. The store’s recipes are thought of from scratch. Cakes are made with the finest natural ingredients, like artisan chocolates and sweet cream butter. Inticing Creations offers wedding cakes in 2 forms the traditional and non-traditional styles. Other specialty cakes are kid’s birthday cakes, adult birthday cakes, groom cakes and certain types of celebration cakes like baby shower cakes. For the store’s gluten free products, Crave Bakery has been helping Inticing Creations to make delicious and sumptuous all natural non-preservative baked products. 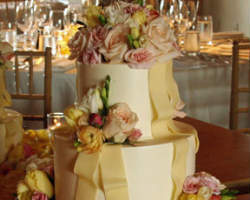 Flours specializes on baking vintage wedding cakes and custom cakes for special occasions. In every possible way, Flours aims to make personalized cakes basing from the expectations of the couples and who would host parties. The popular wedding cake store makes use of organic and local purveyors for the finest baking of wedding cakes and celebration desserts. Flours advises customers to make use of their free consultation sessions and get a sample taste of the yummy bites from already freshly made cakes. Its purpose is to help them think of better wedding cake ideas. The current offerings in cake flavors may come in Tropical (white cake with coconut cream and pineapple bavarian cream) or (Spiced) (ginger and clove spice cake, sancerre poached pears and cinnamon buttercream.) 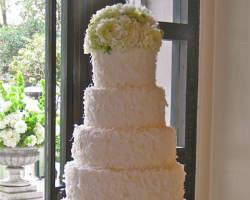 Flours also recommends other wedding specialists to hold events to the fullest among cake bakeries.